Trends come on go. A few weeks back I ran across a Swiss company called Paper.li… a content curation service. Yeah, that’s what I thought too! It’s a service that allows people to publish electronic newspapers base on topics they like and has the ability to treat their readers to fresh news daily. Every day from around the internet there are hundreds if not thousands of articles that are written for the motorcycle community. More than most of us can ever read or assimilate in any single day be it by email or an RSS feed. So how can a person keep up on this ever increasing pile of motorcycle content? I’ll spare you the technical details, but basically this service fetches articles from everywhere and semantically analyzes them for relevance to the community and publishes a daily paper on my behalf. I don’t mind trying out new things especially if it’s not heavy lifting to get started. And this was rather simple if your active on Twitter to set up the “paper” which aggregates the information and delivers curated news to a single well-defined target audience. I’m not running a blogger business, but I could see and appreciate how this type service might benefit inbound/outbound marketing strategies. I like scanning what others are writing about and it sometimes provides me ideas of future articles to explore. 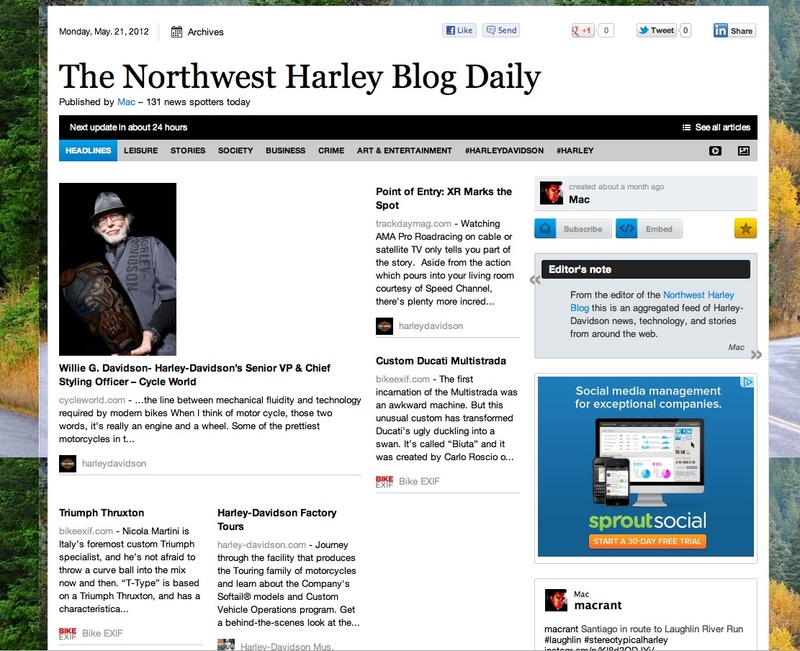 If interested check out the motorcycle news at The Northwest Harley Blog Daily. Is there any wonder why newspapers are going extinct? !